Final Lap (ファイナルラップ, Final Lap?) 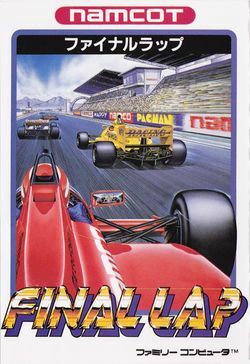 is a racing game developed by Arc System Works (their first published title) and published by Namco, creator of the Final Lap series, for the Famicom in 1988. It is loosely based upon the arcade game of the same name. However, its design philosophy is entirely opposite from the arcade version. The arcade version sought to be the most graphically realistic depiction of racing on one particular race track. Due to the graphical limitations of the Famicom, the home conversion does not attempt to graphically depict any aspect of racing realistically. Instead, it provides the player with a simplistic presentation of racing, but on many different race tracks. Throughout the single player mode, players must compete against a particular rival over 20 heats on 20 different race tracks. Before each race begins, the player may customize his or her driving experience by allotting points to different attributes of their car, include the top speed of the engine, the grip of the tires, the effectiveness of the breaks, and the amount of nitro boost. Like the arcade game, this version allows eight players to compete against one another. However, unlike the arcade game, they can't compete simultaneously. Rather, they must compete two at a time in an elimination-style tournament. This page was last edited on 17 June 2014, at 02:04.